XXXTentacion, born Jahseh Onfroy, was shot and killed on June 18 in broad daylight. 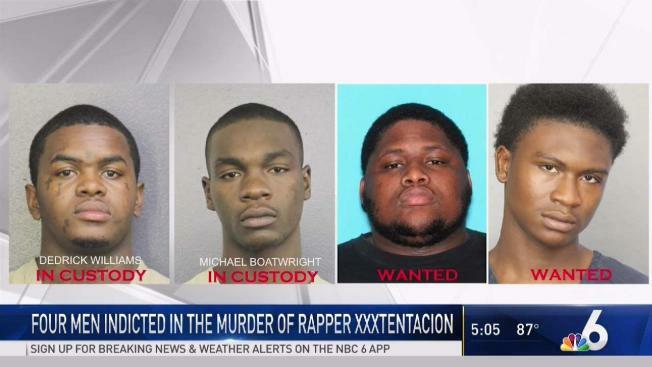 Four men have been indicted in the murder of rapper XXXTentacion in June. A Florida grand jury has indicted four men on first-degree murder and armed robbery charges in the shooting death of emerging rap star XXXTentacion. According to a warrant filed in Boatwright's case, the car driven by XXXTentacion, whose real name was Jahseh Onfroy, was blocked by a dark-colored SUV as it was exiting the Riva Motor Sports motorcycle shop. Two masked men got out of the SUV with a gun intending to rob XXXTentacion, who had a Louis Vitton bag containing $50,000 in cash, police said. A struggle ensued and the 20-year-old rapper was shot multiple times by one or more gunman, who took the bag and fled. The indictment names Boatwright as the person who fatally shot XXXTentacion. Williams was arrested two days after the shooting, and Boatwright was arrested earlier this month on an unrelated drug charge. Authorities continue to search for Allen and Newsome. At least one of the suspects, Williams, was seen in the store on surveillance cameras while XXXTentacion was shopping. A store clerk said Williams purchased a black neoprene mask and that he recognized Williams as a repeat customer, according to the warrant. "Williams stated that he wanted to tell the truth ... Williams stated he was fearful of being labeled a snitch when he went to prison," the warrant says. Other evidence includes cellphone video and photos with three of the suspects holding large amounts of $100 bills, police said.